I can’t find a whole lot of information on this one right now, probably because it’s not due for release until June. I’ve been hearing good things about Liz Williams for a while, and when I saw this book on Goodreads a while ago, the premise completely hooked me: What if being a librarian was the most dangerous job in the world? 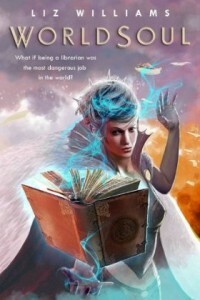 The dangers of being a librarian and ancient legends coming to life sounds like a recipe for a great book! Worldsoul will be the first book in a new series. Worldsoul, a great city that forms a nexus point between Earth and the many dimensions known as the Liminality, is a place where old stories gather, where forgotten legends come to fade and die—or to flourish and rise again. Until recently, Worldsoul has been governed by the Skein, but they have gone missing and no one knows why. The city is also being attacked with lethal flower-bombs from unknown enemy. Mercy Fane and her fellow Librarians are doing their best to maintain the Library, but…things…keep breaking out of ancient texts and legends and escaping into the city. Mercy must pursue one such dangerous creature. She turns to Shadow, an alchemist, for aid, but Shadow—inadvertently possessed by an ifrit—has a perilous quest of her own to undertake.